Maurice made this tweet, (and subsequently deleted it), about the NFL's Michael Sam and his sexuality - but not before it could be read by a lot of people. The Stampeders just issued this statement over Twitter. THIS is the comment the Stamps find "outrageous" and "repugnant"? I'm pretty pissed about this. If that comment I posted above is indeed the comment that the Stampeders have found to be so "offensive" and "repugnant", I will cancel my life-long season tickets. While I can respect that the Stampeders have the right to reprimand Mr. Price for the comment, I ALSO have the right to withdraw my support, both financially and morally, for an organization so completely INTOLERANT of freedom of expression and free speech. Scott Mitchell reported that the Stampeders requested that Mo Price delete the tweet. I will not be attending any Stampeder Games if in fact the Stampeder tweet is correct. Price has a right to his opinion and I as well share his opinion. Sexual preference has nothing to do with the game of football leave it at home. This is what pisses me off about gays. I do not care about their sexual preference it harms nobody for them to be gay but to push their agenda is where I get steamed. So Stamps say good bye to this fan and his family! I support Mr Price! Guys, don’t go jumping off the white horse because the Stamps brass are asking Maurice to remove his tweet. Politics make the world go round. Pro Football is a business at the end of the day Hey, I don’t think it’s right either and I feel that #17 is entitled to voice his opinion. Having said that, I'm not going to bail on a franchise that I've supported for my entire life. May God bless Maurice Price, the entire Stamps organization and Michael Sam! 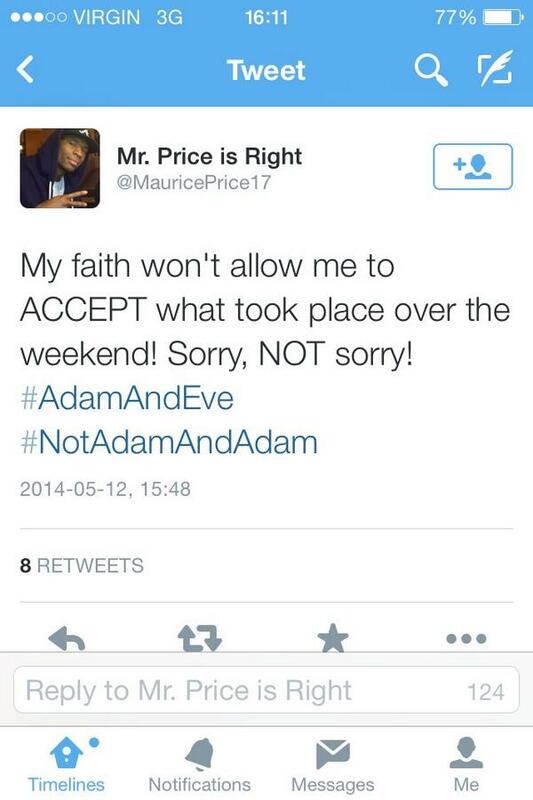 Price has been fined an undisclosed amount by the CFL for his tweet. What he tweeted was his belief, it didn't contain any profanity or hateful remarks regarding homosexuality - he simply stated that he couldn't support it based on his own lifestyle. So is Price's lifestyle not acceptable then? Here is the questionable part of their decision. Aren't they doing exactly that? His religion is what his comments were based off and all he was stating was that based on his beliefs in his religion, (of which he should be protected the same way someone's sexuality should be), he could not accept it. He didn't promote violence, or spread hate, or use slanderous terms to belittle anyone. I fail to understand how Maurice himself isn't being discriminated against. Price has every right to his beliefs. I respect his right to hold those beliefs and I even respect the right for I him to say that he believes homosexuality is a sin. But the suggestion in his tweet was that Michael Sam was undeserving of being drafted this past weekend, because he was gay. That is not a religious belief. That is a discriminatory statement, plain and simple and that is why he is being censured. I think CJZ's views align exactly with mine on this issue. I find no fault in Price's comments about what he says his own religion has taught him. He has every right to hold those views if that is what guides him. But to leap from there to the conclusion that what happened "last weekend" (Sam's selection in the NFL draft) is somehow wrong in God's eyes only because Sam is "gay" (and not because he has no talent, or is otherwise undeserving of selection), is unsupportable. No one would suggest to Price that his opportunities should be limited in football because of how he lives his life, or what his religious beliefs are. Similarly, no one in Sam's position should have to justify to Price why his beliefs, or the way in which he leads a part of his life, should disentitle him from the same opportunities that Price takes for granted. I honestly never once interpreted his meaning of "what took place" to mean his NFL drafting - I have always taken it as the public display of affection between 2 gay men that Price had the problem with and why his added the hash tags he did. I can see why people would be upset if their meaning of that is how you described it, and I would agree with those people if his meaning was absolutely clear and 100% certain that is the event he was speaking about. One thing I despise more than anything is political correctness as it attacks ones right to an opinion. Gays can voice their opinion but no one else can. This is a double standard. If the Stamps management goes to this length for a mans opinion I have zero tolerance for that management. They should be standing up for Price not telling him to hide his opinion. This is out right BS. And for that i will not spend one red cent going to a game. For that matter anything connected to the Flames organization. So the CFL has just done the same thing in fining Mr Price. They are discriminating against ones beliefs and opinion. Yup CFL has turned bush league. I guess I will watch NCAA or NFl from now on. Heck even if they have a couple of gay players it does not bother me. But for a gay player to use his position in a league to promote it is just wrong. Fraser is a jackass and I am glad he moved on! Well, if it's speculation, both the league and his own team employer must both be guilty of it. And one would expect that they, far more than any of us, have had an opportunity to explore directly with Mo Price (no irony intended here ) just exactly what his comments meant. And they still levied the sanction. Sam should be fined for using his position to push his agenda in a professional league plain and simple! Your right TM the team and league are just as guilty! They are the ones that have construed Mr Price opinion into that of one that is in fact bigoted. I am so pissed off at the Stampeders. I suggest the president of the Stampeders has ear muffs because I will be yapping at him at the open house. This is where I cancel my tickets and let him know he just lost four season ticket holders for many years. Like I said TM, if his true intentions of his words were to say he never should have been drafted because he is gay, then I will stand in line next to the rest of you. But the fact of the matter is nobody but Maurice knows what the actual meaning of his words were, so I cannot justifiably burn him at the stake. Common sense should have taken over though and Mo should have taken 3 seconds to think this through before hitting Post. No matter what the intent, it's ALWAYS going to be taken the wrong way by someone no matter the subject. Add that to the fact that he is a pro athlete and the outcome is never going to be a good one.